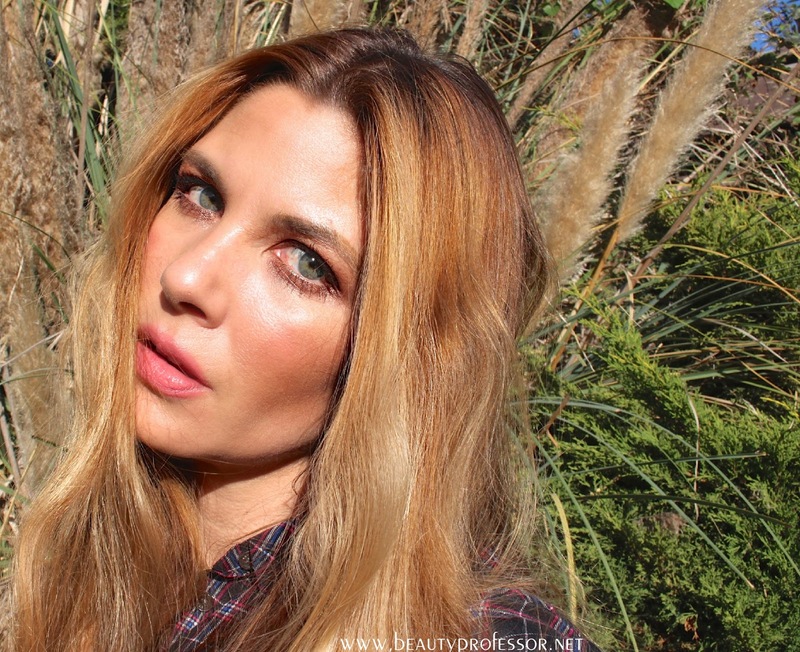 Beauty Professor: Skincare Spotlight: Omorovicza Gold Collection + Giveaway! Skincare Spotlight: Omorovicza Gold Collection + Giveaway! I was first introduced to the Omorovicza line (also available at Beautylish and Nordstrom and Omorovicza) a few years ago; since then, I've tried the many releases from this exquisite Hungarian brand and have integrated a variety of key products into my skincare routine (previous reviews HERE, HERE and HERE). Today, I am thrilled to offer a closer look at some strategic selections in the Gold Collection...with solutions that target dehydrated skin that yearns for a refreshed glow, this range of products perfectly balences luxury with efficacy! I am certainly a gold lover; from radiant necklaces to tri-color vintage rings, to say nothing of the Cartier Love Bracelet which has been on my wrist--nonstop--for nearly eight years, if there is a way to find gold, I'll find it. Consequently, imagine my wonder when I discovered that Omorovicza has found a way to harness the anti-inflammatory properties of gold and infuse it into its premiere skincare! My recent daily indulgence for luminosity and radiance. The *Gold Hydralifting Mask (also reviewed HERE) is a brilliant option for when skin needs an extra infusion of hydration and . I have been reaching for this frequently, especially in light of the excessively cool and dry winter weather we've been experiencing as of late. Upon cleansing, I like to apply a generous layer of this silky mask and let it penetrate deep into my thirsty skin. Rich and decadent, this maks feels more like an opulent moisturizer than a traditional mask; consequently, after 10 minutes, the excess can simply be wiped away, leaving no need to rinse. My skin is left firmer, smoother, more balanced and visibly hydrated! Cooling and velvety, this rose scented flash day mask provides an instant lift and prolonged hydration. Also it ingeniously blurs the appearance of fine lines and wrinkles. Tighten the skin’s surface to visibly reduce the appearance of wrinkles with natural polysaccharide. Blur imperfections leaving skin smooth and silky with bio-polymers. Hydrate, plump the skin and resurface fine lines and wrinkles with three types of hyaluronic acid which release hyaluronic acid sequentially over time for enduring results. Repair accumulated micro-damage to strengthen the skin with a powerful anti-inflammatory, gold ferment. Free from synthetic fragrance, colours and parabens, Omorovicza products are powered by a potent blend of Hungary’s mineral-rich healing waters and our patented Hydro Mineral Transference™ delivery system. This is combined with the finest vitamins, essential oils and natural ingredients sourced from across the globe. Aqua (Hungarian Thermal Water), Butyrospermum Parkii (Shea Butter), Glycerin, Adipic Acid/Neopentyl Glycol Crosspolymer, Prunus Armeniaca (Apricot) Kernel Oil, Microcrystalline Cellulose, Sucrose Palmitate, Cetearyl Alcohol, Candelilla/Jojoba/Rice Bran Polyglyceryl-3 Esters, Saccharomyces (Hungarian Thermal Water) Ferment Extract, Phenoxyethanol, Glyceryl Stearate, Pullulan, Carbomer, Sodium Stearoyl Lactylate, Cellulose Gum, Glyceryl Linoleate, Sodium Hyaluronate, Tocopheryl Acetate, Rosa Damascena Flower Oil, Sodium Hydroxide, Tocopherol, Disodium EDTA, Ethylhexylglycerin, Mica, Colloidal Gold, Phospholipids, Potassium Sorbate, Leuconostoc/Radish Root Ferment Filtrate, CI 77891 (Titanium Dioxide), CI 75470 (Carmine), Citronellol, Geraniol, Citral, Farnesol, Linalool, Eugenol. The *Omorovicza Gold Night Drops are new to my routine. Upon cleansing and toning, I have been buffing a few drops of this gleaming elixir into my skin right before bed. Even if I don't get as much sleep as I'd prefer (when do I ever? ), I am impressed by the fact that I wake up with firmer, brighter, more rested looking skin that I should. I appreciate the fact that the technology behind this serum takes advantage of the skin's heightened ability to repair itself while in slumber and I am a walking testament to the fact that this indeed is possible! This rich and powerful anti-aging treatment harnesses the anti-inflammatory properties of gold to repair, contour and lift skin overnight. A transformative anti-aging night serum, it works in three stages to resurface wrinkles, repair & strengthen, and hydrate & nourish the skin at night when skin is most receptive to healing. Correct and reverse sun damage with vitamin A, reducing the depth of wrinkles and fine lines. Reduce free radical damage, protect collagen and elastic fibres within the skin and revitalize cell-growth with vitamin C. The result is improved skin tone, increased radiance, reduced age spots and restored elasticity. Restore the integrity of the skin’s barrier function, replenish dehydrated skin and restores suppleness with omega 6 ceramide. Repair and prevent photo-aging and chronic photo-damage in the skin while stimulating the skin’s natural defence mechanisms and protecting the skin’s immune system with bifida. Heal accumulated micro damage and strengthen the skin with powerful anti-inflammatory gold ferment. Retexture the lipid matrix to restore suppleness and hydrate dry, dehydrated skin with ceramide. Promote long lasting hydration by increasing moisture retention in the skin with Sodium Hyaluronate. The *Gold Flash Firming Serum is a resplendent delight; although it gleams like Midas in the bottle, don't let the flecks of light mislead you. This is not a shimmer serum! In fact, the light-reflecting particles disappear completely upon contact with the skin, imparting a subtle radiance that looks healthy and glowing, not glittery. On a cellular level, the serum works to moisturize, balance and strengthen skin, fortifying for the demands of the day. I love how nourished and dewy (not oily) my skin looks and feels upon application and am equally impressed by how these qualities are sustained over the course of wear. This is a stunning option for daily wear and a marvelous place to start when deciding on a foray into the Omorovicza Gold Collection. This silky anti-ageing serum instantly soothes and firms the skin. An oil free formulation, it absorbs instantly whilst potent ingredients, led by anti-inflammatory gold, help to repair and re-texture the skin, revealing a radiant, healthy and youthful-looking complexion. “The list of top notch ingredients in Omorovicza's firming serum reads like a who's who of anti-ageing essentials" – Marie Claire Online. Heal micro-damage and strengthen skin with a powerful anti-inflammatory, colloidal Gold. Enhance skin tone and help reduce the appearance of age spots with Vitamin C. It also boosts the synthesis of collagen and elastin to help restore elasticity. Brighten and even skin tone by inhibiting the production of melanin with watercress extract and zinc. Provide long lasting hydration to skin with sodium hyaluronate. Aqua (Hungarian Thermal Water), Rosa Damascena Flower Water, Saccharomyces (Hungarian Thermal Water) Ferment Extract, Glycerin, Corundum (Pro Ruby Crystal), Phospholipids, Alcohol Denat., Phenoxyethanol, Ascorbyl Tetraisopalmitate, Niacinamide, Pullulan, Carbomer, Benzyl Alcohol, Sodium Hyaluronate, Sodium Hydroxide, Mica, Zinc PCA, Xanthan Gum, Disodium EDTA, Ethylhexylglycerin, Chlorella Vulgaris/Lupinus Albus Protein Ferment, Nasturtium Officinale Flower/Leaf Extract, Colloidal Gold, Silica, Parfum (Fragrance), Palmitoyl Tripeptide-5, Dehydroacetic Acid, Leuconostoc/Radish Root Ferment Filtrate, Caprooyl Tetrapeptide-3, Dextran, Linalool, Limonene, Eugenol, Geraniol, Citronellol, Benzyl Benzoate, CI 77891 (Titanium Dioxide). In my experience, the efficacy of eye cream is the most difficult to calibrate. Lauded with impressive reviews, however, I was optimistic about trying the *Gold Eye Lift. As with any good oribital product, a little of this lush cream goes a long way; I prefer to pat it into the corners of my eyes with my ring finger, directing the product upwards for additional lift. Remarkably (and I can only say this about a few eye products in my experience), it does not irritate my highly sensitive eyes (I wear contacts for severe myopia), absorbs instantly and plays well with makeup (no smearing or smudging as the day wears on). Although I need to continue to use this for a few more weeks before weighing in on my complete experience, I am happy to report that I am loving it thus far. This nourishing, anti-aging, gold eye cream reduces the appearance and depth of fine lines and wrinkles and renews elasticity. It also brightens tone and helps to reduce sun damage in the delicate eye contour. Tense the skin in the delicate eye contour throughout the day with the sequential release of chicory root fructo-oligosaccharide. Diminish dark circles with anti-coagulant vitamin K.
Resurface fine lines and wrinkles, and reverse sun damage with vitamin A (retinol). Retexture the lipid matrix to restore suppleness with ceramide. Leave skin firmer, more supple and younger-looking Hydro Mineral Transference™ delivers minerals deep into the skin. Aqua (Hungarian Thermal Water), Rosa Damascena Flower Water, Citrus Aurantium Dulcis (Orange) Flower Water, Glycerin, Butyrospermum Parkii (Shea Butter), Simmondsia Chinensis (Jojoba) Seed Oil, Squalane, Caprylic/Capric Triglyceride, Cetearyl Ethylhexanoate, Cetearyl Olivate, Stearyl Heptanoate, Cichorium Intybus (Chicory) Root Oligosaccharides, Cetearyl Alcohol, Sorbitan Olivate, Ascorbyl Tetraisopalmitate, Prunus Armeniaca (Apricot) Kernel Oil, Cera Alba (Beeswax), Saccharomyces (Hungarian Thermal Water) Ferment Extract, Helianthus Annuus (Sunflower) Seed Oil, Phenoxyethanol, Mannitol, Sodium Lactate, Glycine Soja (Soybean) Oil, Arnica Montana Flower Extract, Laminaria Digitata Extract, Safflower Glyceride/Palm Oil Aminopropanediol Esters, Xanthan Gum, Disodium EDTA, Pyrus Malus (Apple) Fruit Extract, Prunus Domestica Seed Extract, Tocopherol, Ethylhexylglycerin, Phospholipids, Colloidal Gold, Retinol, Gluconolactone, Chlorella Vulgaris/Lupinus Albus Protein Ferment, Pectin, Caesalpinia Spinosa Gum, Yeast Extract, Leuconostoc/Radish Root Ferment Filtrate, Medicago Sativa (Alfalfa) Extract, Sodium Benzoate, Palmitoyl Tripeptide-5, Glyceryl Caprylate, Caprooyl Tetrapeptide-3, Dextran, Citronellol, Geraniol, Linalool. Gold Flash Firming Serum under makeup with a touch on the high points of my face (over makeup) for an ethereal glow. Bottom Line: The Omorovicza line (also available at Beautylish and Nordstrom and Omorovicza) is most definitely a worthy splurge. From the exemplary ingredients to the potent actives that truly deliver results, I am consistently impressed with the Omorovicza products that I try. I am over the moon to be able to offer Beauty Professor readers a chance to try all four products discussed in this post! (3) LEAVE a comment that shares a fun beauty tip and a bit about why you'd like to try the Omorovicza Gold Collection, along with an email address, Instagram name or Twitter handle (your choice) so you can be directly contacted should you win. A winner will be chosen at random and informed of their win on Monday, February 1st, 2016 by 12PM PST. Once notified, they will have 24 hours to provide their mailing address ( a new winner will be chosen at random if the initial winner does not respond within 24 hours) so that the collection can be sent directly from Omorovicza. I wish you the best in this exciting giveaway and look forward to reading your comments! I always heat my lash curler (very carefully) before inserting my eyelashes. It definitely enhances the bend. I am always searching for the best eye cream, and have read many positive comments on the quality of this line. I recently purchased the Sunday Riley Luna Oil and Good Genes, so I would love to try something new. My email is potownsol (at)gmail.com. For transparency's sake I use Bob Smith as my facebook name. I wouldn't want it to appear I was resorting to subterfuge to increase my chances of winning. Thank you for this most generous giveaway. I have no fun tip, sorry to say:((. This looks amazing, I would love to try the serum and mask. Good skin care costs $$$$, it's an investment not only looking great as we age but feeling confident as well. Thanks for an AMAZING giveaway.email address is shopping.addict@aol.com. Thanks for the give away. My beauty tip is before applying oil using a facial spray so that oil can be more quickly absorbed into skin. I have tried omorovicza thermal cleanser and mask before and I liked the result. Since my skin is dehydrated esp in winter, I would like try their gold line for hydrating and firming effects. My email is Chloegong@yahoo.com thanks and good luck to myself! Hi Raquel, Thank you for another brilliant article. I am not sure where I should post a comment regarding the "giveaway". I already "like" you on Facebook, am subscribed to the blog and YouTube Chanel and have liked the Omorovicza Facebook page. Hi! I would love to try to the Gold Firming Serum - who wouldn't love a nice dewy glow in these gloomy cold winter months! I don't really have much in terms of beauty tips, but something my grandmother always taught me was to wear use my face creams on my neck and hands! Also, she always says (even at 95 years young!) that nothing is prettier than a smile!!! What a great price and a great chance to try these products! I just recently got to know Omorovicza for a bit and tried a cleanser from this brand; I loved it. All 4 products above seem wonderful and what my skin needs...would defenitely like to try these. With this cold my face can use a little more TLC ;-). I take a mask every week to take care of my skin and to soften, clean and nourish. Especially in the winter time I feel my skin's need for this. Also in wintertime I scrub my lips every week or 2 weeks to keep them soft and smooth with special lipscrub. This product line intrigues me and I'm at the right age for it at 47. I would love to win the give away, but what if I love the line? I'll go broke!! I put my eyeliner pencil in the freezer for 10 minutes or so before using it to keep it from crumbling and to help it go on more smoothly. I would love these products since I am in my early 50s now and everything is starting to sag and wrinkle. I have been dying to try this brand for ages! Favorite beauty tip: learning the importance of fatty acids and pH when it comes to your skin. Cleansing with a gentle cleanser that won't compromise your skin's pH balance, following up with an acid toner like Biologique Recherche Lotion P50, then sealing it all in with a lush oil high in essential fatty acids. Works wonders! My fun beauty tip is to find a lovely luminous blusher if you're a mum who doesn't get much sleep like me! It instantly makes me look more awake and fresh even if I don't feel it. I'd love to try the gold collection as all the other Omorovicza products I've tried have been amazing, especially the Queen of Hungary Mist. My twitter username is taitinthesylph. Beauty tip, I like to use the Omorovicza beauty mist to set my makeup, it's awesome refrigerated and used for sunburn relief. I have been using the gold eye cream for 9 months now and it's the only eye cream I have seen a difference, you have to be patient but the wait is worth it. I have tried almost every high end eye cream, this truly works. I haven't tried anything else in the gold line, but have had amazing results with their other products, especially the copper ampules. I would love the opportunity to experience the other complementing products in the Gold line. Beauty Professor, you are pretty much spot on with product reviews and recommendations. Amazing giveaway! I would love to try the Omorovicza brand! My fav beauty tip is face masks and usually them at least once a week! I put them in the fridge and pop them on! My twitter is @skinnyd0nut. As a fun beauty tip - I'm a curly-headed girl, and I've been having great success recently with the Briogeo products now available at Sephora. They're great at keeping hair moisturized and curls bouncy. This is such a great giveaway - I've been dying to try the Omorovicza branch for some time now. I can be reached on Instagram as MerRhosyn. I never leave my apartment without a few Q-tips in my purse if I'm wearing makeup. It's the perfect size to get rid of any mascara or eyeshadow if it gets under the eye (and then you look polished again!). I would like to win this giveaway because Omorovicza is a brand I've wanted to explore more, but I can't afford it, which is frustrating because I really, really love skincare. Thank you so much for the opportunity <3 and good luck to everyone! My fun beauty tip...I pat in my concealer under my eye area with a dry sponge (I use a RT Miracle Complexion sponge). It sets my concealer perfectly and keeps the excess product for settling into fine lines. I don't powder under my eyes and this is a perfect method for applying my more "wet" concealers. Would love to try the products. I have never heard of this brand. Have a great day! Fun beauty tip: I use my lipsticks as a cream blush. (Usually when I just need quick flush of color) dab on apples of cheeks and smudge out ;) I would love to try omorivcza as it sounds like such an intriguing skincare line and I'm obsessed with skincare! Email: chayaf@me.com * Instagram: @bitzofglitz Twitter: @bitzofglitz thanks for this awesome opprtunity! Thanks for great giveaway! I started to use Omorovicza products last summer with Cleansing Balm and Introductory Set. I really love to fix my make-up with Queen of Hungary Mist. I am using the Hydra Melting Cleanser and Elemental Emulsion at the moment. As my skin is very sensitive and rosacea is appearing on my cheeks I would like to try Gold range. Gold range products contains colloidal Gold which is anti-inflammatory and helps to heal the sensitive skin - hope it would solve my problems. I sharpen my eyebrow pencil tip to a square shape to make it a easier application. I've heard Omorovicza for a for long time and recently received rose gold serum as a christmas gift. WOW! Amazing! It is not too oily yet hydrating for a guy. Therefore, I would like to trail on there products and even be a bigger fan! My tip is to always use a wash cloth when cleansing the skin )I love the Omorovicza mitt), and always cleanse twice in the evening )I love the Omorovicza balm and foam). I would love to win, as my skin is very dry this winter and as I tried Omorovicza before I am sure this line will be able to help. Ooooo....These gold products have really piqued my interest! They also bring back memories of when I struggled through two quarters of the Hungarian language in college! My fave beauty tip of late is to use clear brow gel instead of pencils or other brow products. The look is much more natural, but still keeps my brows looking polished. 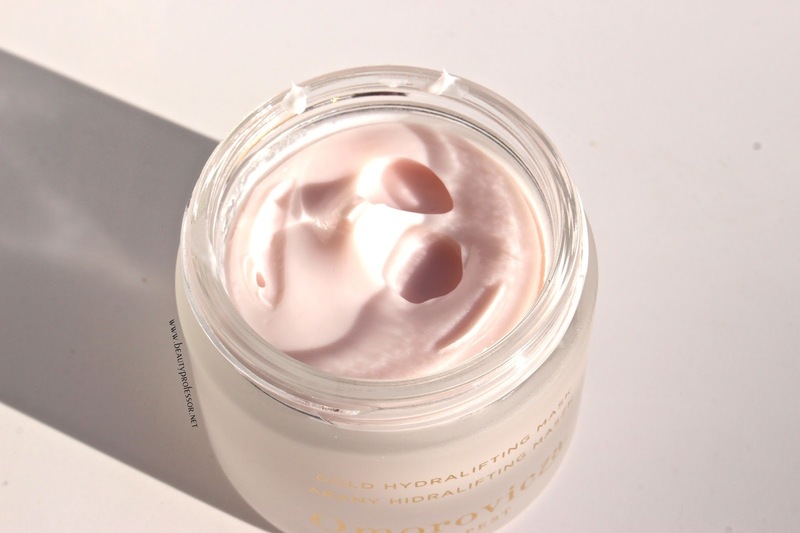 I would love to try Omorovicza's Gold Hydralift Mask to achieve a fresh spring glow. Spring is coming, right?? Love this blog....my email is leahy_m@msn.com. I would LOVE to win this - I have a tiny sample pot of Omorovizca's night cream that I've been hoarding forever, only using the teeniest bit on my driest patches. A beauty tip for dry winter scalps - before bed, rub coconut oil into the scalp with your fingertips, not your nails! In the morning, do a quick rinse with a couple tablespoons of apple cider vinegar in 2 cups of water and then shampoo/condition as normal. I do this once a week when it gets super dry out! Oh my, slaps hand to forehead...POST COMMENT HERE. I would love to try the Gold Collection because I once received a facial and a gold infused mask was applied, it left my skin very luminous for days! I wonder if similar results could be achieved with regular usage?!? My beauty tip: After curling eye lashes and applying mascara, I use my air dryer with the nozzle pointed up wards. Sets your lashes and really helps the curl stay! Every Omorovicza product I have tried has been absolutely wonderful. This skin care line is high end but delivers great results. Worth every penny to have healthy, glowing, hydrated skin. My beauty tip is one my mom taught me many years ago when I was a teenager. Always take care of your skin, always use high quality skin care, don't skimp, it is the only skin you have. Mom was right. She would have loved the Omorovicza products. She would have told me to go for the Gold! Email address is rtrasatti@iname.com. Thanks for spotlighting Omorovicza products. They deliver results. I’ve been looking for a good skincare products for ages and this sounds like just what I’ve been looking for. - And of course - use quality skincare! Omoroviczac is a very luxury brand... I would love to try out this gold line because I'm obsessed with all things mineral and love a range based on proven historical benefits. Moreover I love Retinol and Vitamin C in skincare products. Ohh, hmmm, a tip! There's so many lol but one I recommend is remembering to wash your face every single night! Even if you didn't wear makeup that day, it's good to cleanse your skin so that your cells can regenerate well overnight! I used to be lazy with washing my face when I was younger, but now I know better. I break out less and I look more awake in the mornings! I would love to try these products because I always hear such fantastic things about them. Plus, since I'm a student with low income, it would be a nice treat to try something which I can't afford for another few years lol! My email is sabrunka@yahoo.com, and I also have instagram where my username is sabrunka. My fun beauty tip is to use a toilet seat liner as a face blotter as you're, ummm, you know. It works great and is flushable!. I've never tried the Omorovicza line, but would love to. My fav tip would be to always be diligent about moisturizing and anti-aging products! Wash your face EVERY night too! I would LOVE to win this because it looks AMAZING and I am getting married this June & my skin DEFINITELY needs a lot of love. This would be perfect!! I really don't have any fun little beauty tips sadly.. I'm sort of "new" to the beauty world and just trying to find my spot hah! So I'm just a newbie in the process of learning! A fun beauty tip, that everyone should know/do is: blending your foundation with your neck. Just not foundation, but any creams, serums, etc. Your neck needs love too! It ages just as your face does. Lastly, sunscreen! Most important beauty tip is to use sunscreen! It keeps your skin from damaging in the long run. I would love to win these Omorovicza products! My skin is horrible during the winter months and needs to be revived! I think these products will help combat the harsh and cold weather! My other comment was lost it seems. I hope I can still enter. I would so much love to try this line, I have used several body products from this line. My beauty tip is double cleansing and facial massage, a good night's sleep and avoiding sun. Thank you so much. My beauty tip would be hair mask with rye bread and egg yolk - works wonders! As of my skin routine - I have tried some of Omorovicza products and they are pure miracle! Winning the gold collection would be a bliss. Video: What's in My Makeup Bag?